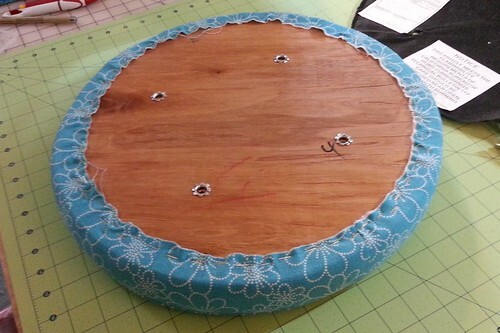 For more than a year, I've been trying to find the time to reorganize my sewing room. Fabric and crafting supplies have been stacked and stuffed into every corner of every shelf so that there was barely enough room to work - and a lot of space was being used to store supplies for needlework and crafts that I rarely do anymore. A total makeover and reallocation of space was needed, but I never seemed to find enough free time to tackle this project. So I decided to break it down into smaller, more manageable tasks, until I could take some time off to completely empty the room. I had some down time in January, so I started emptying shelves and moving boxes of supplies downstairs to the dining room, for 'temporary' storage. When there was enough room to move around and take accurate measurements, I was able to devise a new, more efficient floor plan. I also started collecting storage and organization ideas on My Sewing Room Organization & Inspiration board on Pinterest. 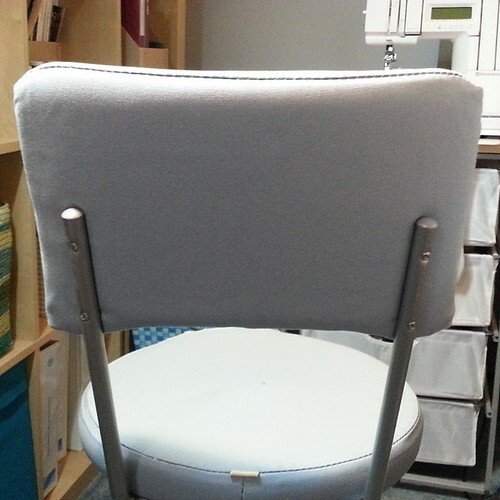 Originally, I thought I could get the project done in my spare time, beginning in February with two relatively simple projects: re-upholstering my swivel chair and changing the window treatment. I have spent many hours in this chair, sewing and machine embroidering. 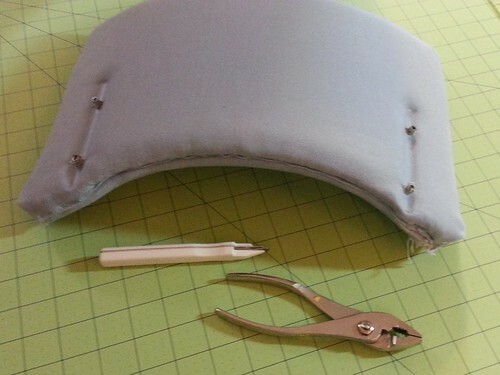 It used to be a pale shade of gray blue with white vinyl piping trim. Over the years, the trim yellowed, dried out, cracked and peeled off. And then the seam on the seat started to come apart. 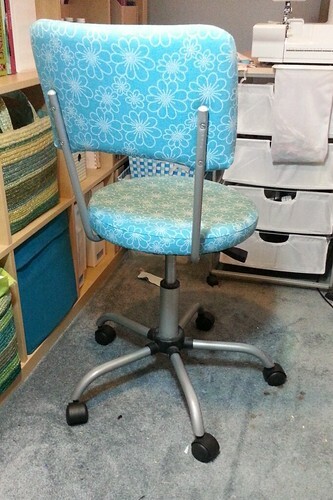 Other than those two flaws, the chair is in excellent condition, so it only needed new covers for the seat and back. This project took the better part of an afternoon and evening, with a few breaks to feed and walk the Westies. I tackled the seat back first, since it was easier to take apart by simply removing the screws. Next, I removed the staples along the bottom edge using a staple puller and pliers. 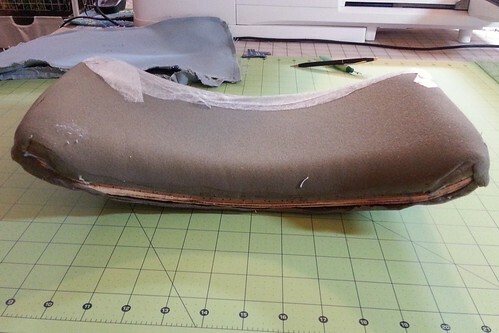 Here's the core of the seat back after the old fabric was removed. It's a wooden base with a gray foam cushion wrapped around it. 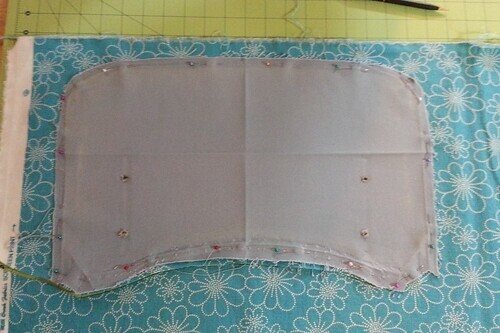 Rather than starting completely from scratch, I clipped to mark the centers along the top and sides of the old cover and carefully took apart the seam so the front and back pieces could be used as patterns for cutting out the new fabric. I chose a fun turquoise blue and white floral print from my stash of home dec fabrics (and decided not to add any piping trim to the new cover). With the right sides together, I matched the clip markings on the new fabric pieces and pinned them together, easing in along the curves where needed. I stitched the two pieces together, trimmed the seam, clipped the curves and then turned it right side out and pressed it well. Then I stretched it over the seat back cushion, smoothing the fabric and stapling along the bottom, trimming where necessary and folding to hide the raw edges (sorry, I neglected to take any photos of that step!). Now it was time to tackle the seat. It was a little more difficult to remove from the frame of the chair because it kept swiveling. 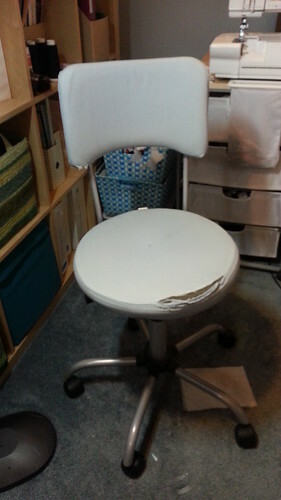 I ended up turning the chair upside and hanging it on the edge of my table to remove the screws. 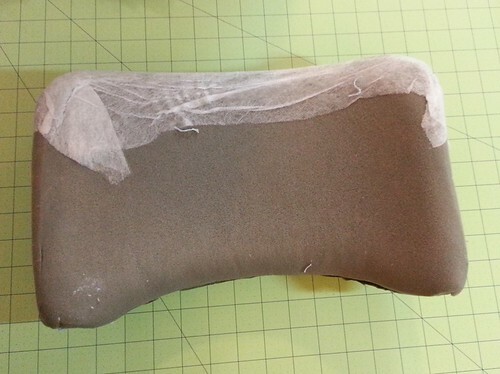 Then I removed the staples on the bottom of the seat, first for the dust cover and then for the old fabric cover. A small pry bar and pliers worked great for pulling the staples out of the wood. Just like the chair back, the seat cushion had a wood bottom with a foam cushion attached to it. Since the old cover was torn in places, I didn't bother to use it as a pattern for the new cover. 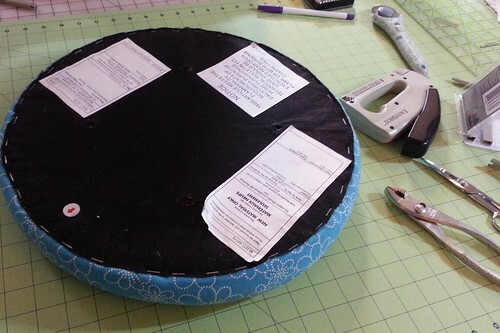 I just traced a circle around the seat on the back of my fabric and added a seam allowance to cut it out. 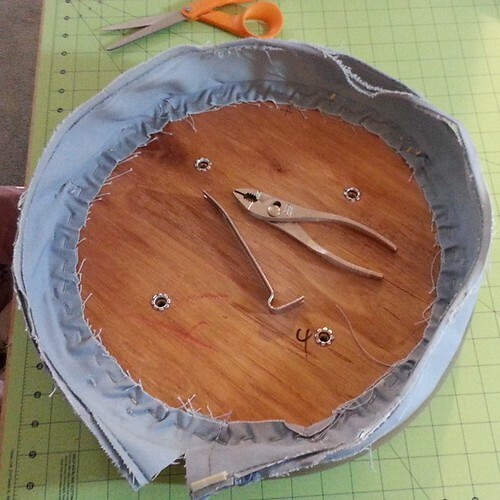 For the boxing strip along the side of the cushion, I simply measured around the circumference of the seat and cut it a little longer. 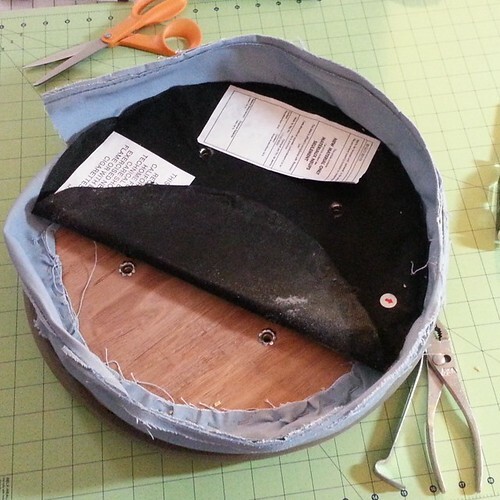 The new seat cover and dust cover were then stapled onto the seat cushion base. 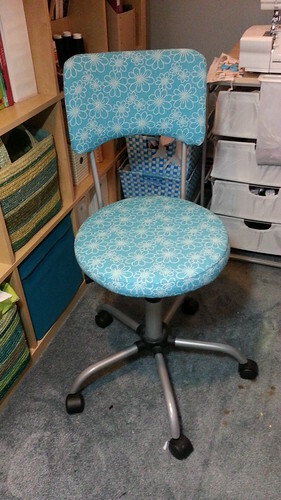 Finally, I re-attached the seat and back to the frame of the chair and it's makeover was complete! This chair is from IKEA and was called 'LOVE' - and I just LOVE it's new look! The color and floral print are such a happy combination! 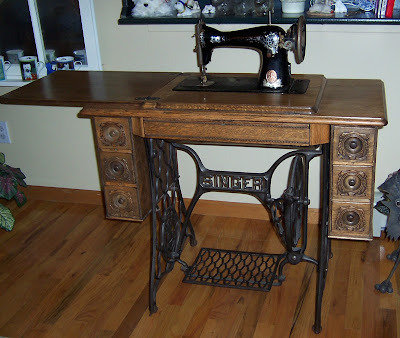 This sewing room has evolved over the past 15 years. Originally, is was a spare bedroom where I also kept my needlework supplies and occasionally set up my sewing machine. When we moved into this house, my sewing room was the second or third room that I redecorated, removing little boys' wallpaper and painting it a nice soothing blue with green accents. The top section of the wall is sponge painted with various shades of ocean and sky blues and greens. 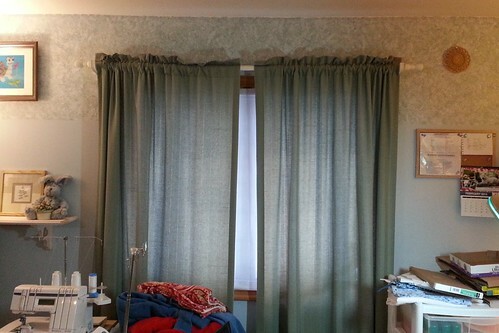 When I was finished painting, I found these sage green drapery panels that helped block out the sun and keep the room cool. I didn't spend too much time working here other than to pick out threads and linen for my cross stitch and needlework projects. After a few years, I started spending more time sewing and machine embroidering, rearranging the furniture several times and adding shelves and a bookcase for storage. I'm tired of these plain green curtains, so I decided to replace them with a fun new window treatment to go with my newly improved swivel chair. 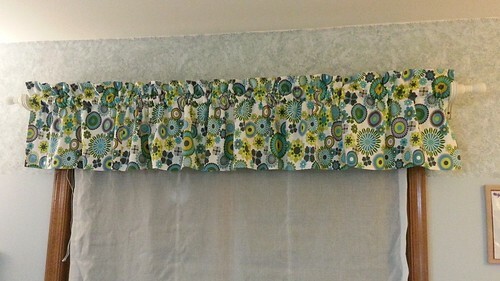 This mod floral print is another home dec print from my stash, and since I didn't have much of it, I made a very simple window valance. 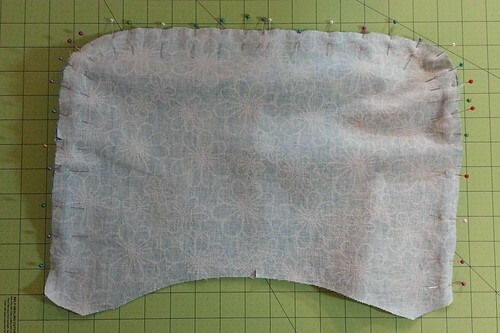 I pieced together 3 panels of fabric to get the width needed (2x the window width), serged the raw edges all around for a nice clean finished edge, hemmed each side and then blind-hemmed the bottom edge. 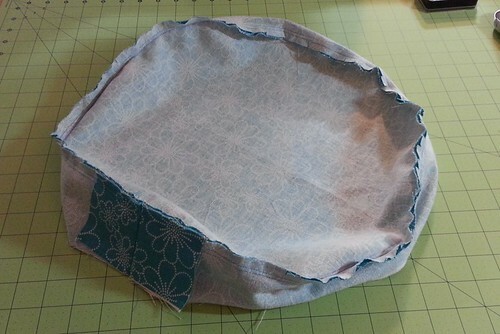 Last, I folded the top down and stitched across twice to form the header and casing for the rod. The gauzy panel was an early attempt at making a roman shade, but the rings that the cords are supposed to slide through had decayed and crumbled in the sunlight and it could no longer be raised. Plus it attracted too much dust, so it had to go too. 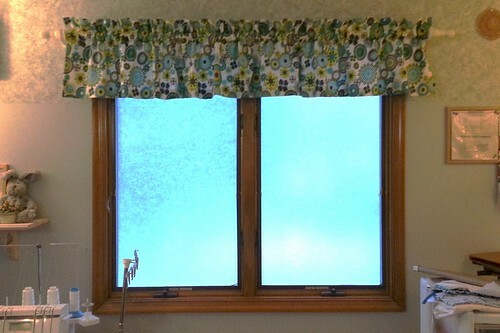 Instead of replacing it with another shade, I applied a vinyl film to the window that looks like rice paper, for privacy and light filtration (it matches the film I used in my powder room in 2012). This photo is a little dark, but both changes really brighten up the room and provide lots of natural light while I'm working. 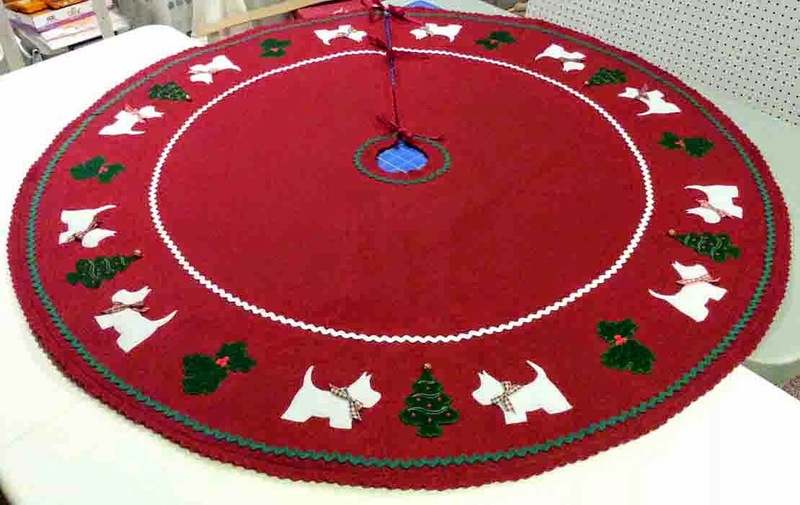 After these two projects were complete, we estimated that the rest of the sewing room makeover would take about a month, so I scheduled a 'vacation' from sewing for July and August. We not only re-organized the furniture, we removed the old carpet, installed laminate floor, added a section to my shelving unit, built a new ironing station and a few other things. It was an exhausting project and I'm very happy with my new work space - it turned out great! 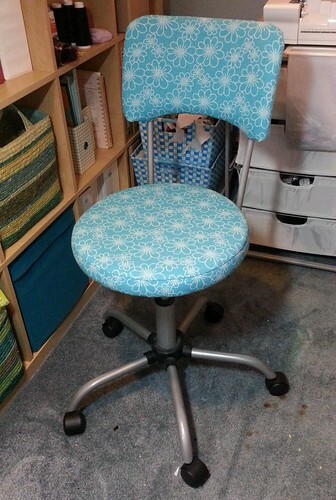 I'll have a couple of addtional blog entries to share my new and improved sewing 'studio'! That settles it. You're Super Woman. Beautiful job!!! You have given me hope for my office/sewing room/grandkids sleep-over room!